A pro-DACA protest rally outside the Philadelphia offices of the Justice Department. For activists who fight for DACA, and its recipients — the Dreamers — the last few days have been chaos: Calming fears, as best they could. Relaying information, as much as they can. And in the rare quiet moments, settling into the realization that the young people they have watched grow up in the only country they've ever known are about to have their tenuous, temporary excuse for support ripped away from them. That we are that kind of country now. But there aren't too many quiet moments. Time isn't a luxury afforded to the desperate — to Dreamers who were given a promise that was yanked away from them. President Trump couldn't even announce the news himself — that he'd decided to "wind down" the Deferred Action for Childhood Arrivals program. That, of course, is the Obama-era initiative that shielded from deportation nearly 800,000 young people brought here illegally by their parents as children. Including 6,000 in Pennsylvania. For anyone in need of anything other than a moral argument of why it's un-American to separate strivers from their futures, here's one, as reported by colleague Aubrey Whelan: 87 percent of Pennsylvania's DACA recipients are employed, generate more than $357 million in the state economy, and contribute more than $20 million in state and local taxes. Trump has decided this is a fractured country, and he's chosen the piece of it he's going to stand for. All across Philly last week, others have been standing by the Dreamers. "First came the tears," said Bethany Welch, the executive director of the Aquinas Center, a welcoming center for immigrants in South Philadelphia. "Then came the rallying cry." That rallying cry has centered on providing comfort and safe spaces for those who grew up uncertain and frightened — but were afforded a modicum of stability — and who are now once again living in fear, said Erika Almiron, the executive director of the immigrant-support group Juntos. And it has centered on rallying others who want to help: by calling on legislators to demand not only relief for Dreamers but a pathway to citizenship for them; by calling on employers and educators to stand by their workers and students; by inspiring ordinary folks who want to lend their voices and march in the streets. And calling for all to stop demonizing Dreamers' parents as criminals for providing a better life for their children, says Maria Sotomayor, a deputy director for the Pennsylvania Immigration and Citizenship Coalition (PICC). She, herself, was a Dreamer until obtaining permanent legal status. When we talk of the successes of Dreamers, we have to remember they are who they are because their parents worked like hell and raised them to do the same. God help us if we're now a country that punishes children for that. The biggest need right now boils down to money, as everything in America does. Specifically, funds are needed for the last waves of DACA recipients, those eligible to renew before the fast-approaching Oct. 5 deadline. It costs $495. And that's not money everyone has at the ready. Prudence Powell knows that. Her parents sent her from Jamaica to live with relatives in New York when she was 12. She signed up for DACA in 2014, got off assistance, got her GED at Temple, and now works as an office manager at PICC — to help others like herself, she said. Her 17-year-old son, a senior at Roxborough High School, is looking at colleges. Her 12-year-old daughter is a seventh grader at the Dr. Ethel D. Allen elementary school, interested in singing and dancing. Powell now faces that looming deadline. Before last week's announcement, she was planning to spread her payments out over a few paychecks. Now she doesn't know what she's going to do. "I'm fighting for my life," she said. Advocates estimate there may be hundreds, if not more, of people across the state, in the same situation as Prudence Powell: eligible for the complicated DACA renewal process, but unsure how to do it, or scrambling to find the money. 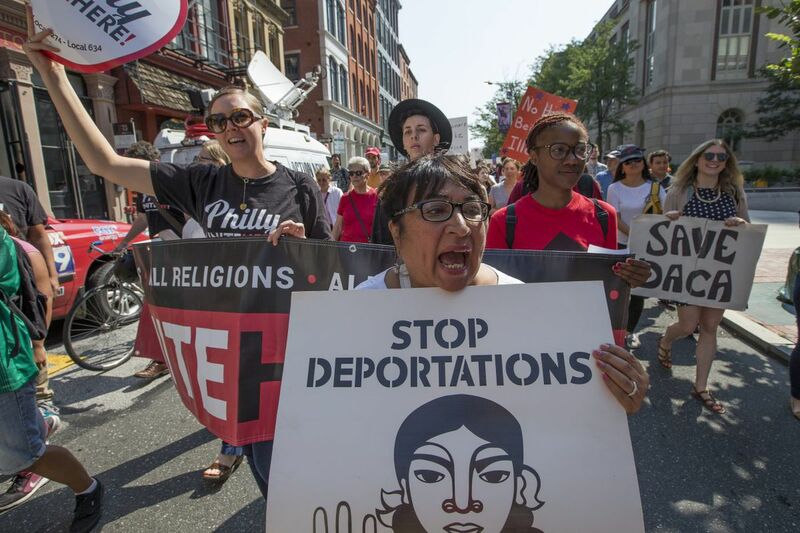 "That's the focus now," said Steven Larin, senior director of legal services and immigration policies of the Nationalities Center on Arch Street. "Identifying who is eligible and lining up resources." All week, groups such as Aquinas and Juntos have been fund-raising on their own. Late Friday afternoon, the Philadelphia Foundation, with support from PICC and Councilwoman Helen Gym, announced a fund-raising drive: the Dreamers Initiative. Funds will help eligible Pennsylvanians cover their DACA permits. Anything left over will go to immigration-support groups doing all they can. I'm going to help them. Let's be that kind of city for our Dreamers.